*AoV2-139 / GA525 / SP&P045 Gather us O God Body spirit soul and mind (Brown) Very simple song. Would work well as a gathering chant "Gather us O God, Body, spirit, soul and mind. 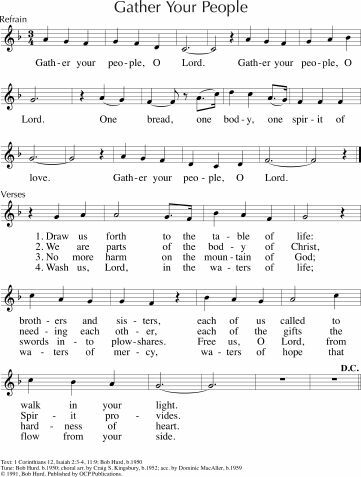 Gather us, O God, One in union now with you"
Tune In / Online Resource Longing for you (Elaine Loukes) A simple chant of longing for God; "Call to us lead us on". Sound sample, lyrics. ATFG 514 Emmanuel Carol / God of light we are waiting for you This is a lovely simple song, and easy to pick up I think; although it's really an Advent song, so you may also want to save it. Cha137 Blessed be the God of Israel / Song of Zechariah (Perry) Single line refrain of the above, sung with a responsive reading. *TiS 279 / AHB 212 / SFFS 2091 / HPP158 / GC487 / GC(II)494 / CP632 / Lau107 The King of glory comes the nation rejoices (Jabusch) Fun and energetic song to a traditional Israeli folk melody. A good processional. Lyrics. Good for kids. *AoV1-061 / ATOK 355 / GtG359 / SFFS 2194 / G(II)521 / GC723 / GC(II)707 / G(3)814 / ZSS110 / SgTJ1035 Freedom is coming (South African) Excellent and lots of fun, especially if you have a keen African-style drummer in your congregation. It's really worth teaching the parts to your congregation before the service. It can get a bit confusing for the congregation otherwise. Sample sheet music. Good for kids. *Tune in: We are the dream that's longing / Jesus is waiting. An honest catchy rock song about our hesitation to follow and Jesus not only waiting, but continuing to work and change the world. A good sending-out song. Sound sample, lyrics and songbook available here. *TiS 688 Come to be our hope O Jesus (Marachin) This is a really fun Latin American song from the World Council of Churches Assembly in Canberra. It's not easy the first time, but once you've heard it, it's very catchy. The words are really excellent, despite a slightly clunky translation. It would be worth teaching to your congregation! Good for kids. *TiS 265 / AHB 193 / AoV1-174 / NCH116 / CH273 / UMH211 / VU001 / LBW034 / ELW283 / GA285 / HPP92 / PH009 / GC317 / GC(II)323 / G(3)395 / CP089 / CP(E) 32 / W&R154 / Cha119 / 82Hml-056 / Lau112 / StF180 / MP493 O come O come Emmanuel (Psaleroilum Cantionum Catholicarum) A very well known ancient Advent carol - so you may want to wait another week before singing it, depending on the traditions of your congregation. Most versions are pretty inclusive. Lyrics and sound sample. There are also two alternate versions (one by Sue Wickham and one by John Henson), set to the same tune, but with more modern lyrics and ideas. See the Facebook Group for lyrics. Oldy-but-a-goody. Emergent Psalter / PfAS046D The Lord of hosts is with us (Everett) Simple and haunting refrain. *CH289 / GC(II)341 Lift up your heads eternal gates (Weissel / Bell) I like how this reworking of the old standard turns the violent battle kingly God image on its head and points to Christ instead. "God's matchless and majestic strength in all it's height, depth, breadth, and length, now is revealed its power to prove, by Christ protesting "God is love!". The tune is a lovely old medieval-style tune, which should not be difficult. The chorus has been written in 4 parts which would be great if you can get some singers to sing the parts, or teach your congregation the chorus before the service starts. The parts for the chorus are very simple. Sound sample. Lyrics and lead sheet. 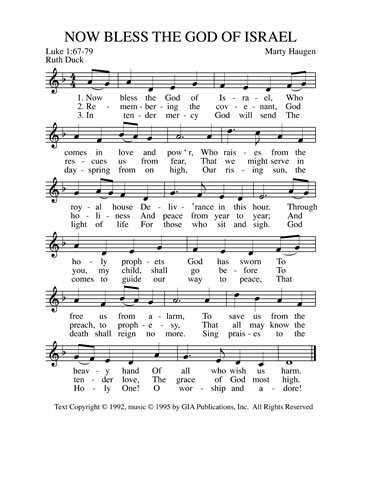 VU770 / Cha742 A mighty fortress is our God (2 lines only) (Luther) Nice use of the hymn as a simple refrain to a responsive Psalm reading. If you like the old hymn, but aren't sure you want to use all the lyrics, this could be good option. Oldy-but-a-goody. VU789 / Cha738 A mighty fortress is our God (Response) Responsive psalm with sung refrain of the first line of "A mighty fortress". This version is even shorter than the last one. Oldy-but-a-goody. ATOK 311 / CH754 / GA401 Be still and know that I am God and there is none beside me (Iona) A good alternative. I like the 2nd verse especially "I am the one who calls you my friends, and there is none beside me". CH doesn't have the 2nd verse. CH037 God is our refuge God our strength (Church Hymnary) This is a better version of this old song from the Scottish Psalter. Linnea Good: Come and ponder everything. A quiet meditative chant of only these 4 words to be sung as a refrain to the reading over background music. Quite a different take on the psalm; would be good to provide some space in the worship service to include this. MV084 In you there is a refuge (Wehlander / Good) A simple quiet song. "In you there is a silence, in you our minds are clear. When all we hear is discord may your quiet draw us near". 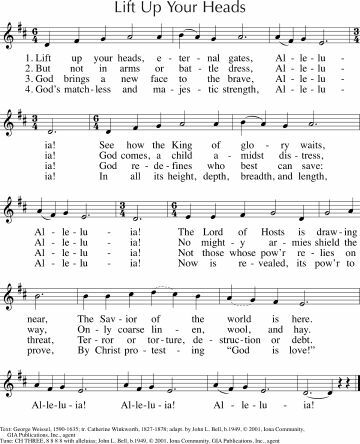 A hymn in praise of Christ. **URW093 Christ is the Truth the Way (Duck) Excellent words of the leadership of Christ, sung to the majestic tune DIADEMATA. This is just excellent for this Sunday! BUC Song Project Well I'm going to see my King (Lees) This song is a fun gospel song in two parts. It may need to be taught so the congregation knows whether they are singing the lead or the response. I think it would sound great if the congregation learns the response part. Could work well with kids, especially if you focus just on one verse. TiS 626 / AHB 557 / CH500 / GA423 / Lau869 Lord of creation to you be all praise! (Winslow) A wonderful traditional, and quite inclusive, hymn to the familiar tune SLANE. Lyrics. Oldy-but-a-goody. *TiS 185 Alleluia We praise you God Creator Lord (McIntyre) A chanted Alleluia based on Pachelbel's canon, coupled with some nice affirmations of faith from a 2nd part of the congregation, or cantor. This is quite lovely. *NCH302 / VU212 Eternal Christ you rule (Damon) Challenging words about how the rule of Christ is so vastly different from the rulership of popular earthly leaders. Simple hymnlike tune. *FFS08 Broken the body (Murray / Bray). Good words of a broken body of Christ and a broken Church seeking healing, unity and courage. TiS 357 / ATA 147 When his time was over the palms lay where they fell (Mann) Beautiful and mournful. Lyrics. TiS 345 / AHB 261 / AoV1-103 / NCH229 / UMH288 / VU144 / LBW81 / ELW353 / GA336 / A&M144 / HPP185 / GtG228 / PH102 / G(II)302 / GC416 / GC(II)438 / G(3)511 / CP192 / CP(E) 126 / W&R283 / Cha198 / 82Hml-172 / Lau225 / StF285 / MP745 Were you there when they crucified my Lord? A classic - well known, beautiful to sing and listen to. Lyrics and sound sample. And a youtube of Paul Robeson. Oldy-but-a-goody. CH389 Behold the holy Lamb of God! (Malawi hymn) This will take some practice, I think. A song with a Cantor and response; you will need a small group to lead the congregation in the response. "O Christ, What Can It Mean For Us to Hail You As Our King"